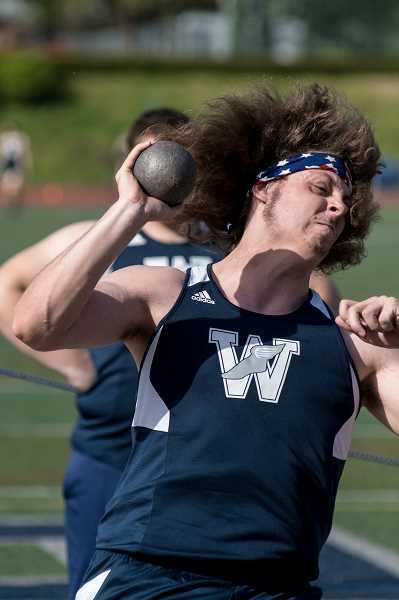 The track and field season is in full effect, and Wilsonville is off to a solid start against league competition. On Wednesday, April 3, the boys and girls teams defeated the visiting La Salle Falcons. The boys team won 84-61, and the girls team won 79-65. Even the JV teams picked up decisive wins, with the JV boys winning 87-39, and the JV girls winning 74-42. On the boys side of things, freshman Rocco Marshall picked up first place in the 100-meter dash with a time of 24.28 seconds, followed closely in second and third place by seniors Jonah Gomez and Gabe Pernisco, respectively. In the 1,500-meter race, senior Jack Burns took first place with a time of 4:26.39, showing off the racing speed he built up during cross country. Sophomores Sebastian Pinger and Caleb Yaso took second and third, respectively. In the 3,000-meter race, freshman Ben McClelland took first place with a time of 9:53.64, followed by brother Jacob McClelland in second place. Sophomore Payton Dart took first place in the hurdles, clocking in at 15.99 seconds in the 110-meter hurdles, and finishing with a time of 42.75 in the 300-meter hurdles. Senior thrower Mike Church had a big day, taking first in the shot put and javelin. In the shot, Church threw for 50 feet, 2.5 inches. In the javelin, Church threw for 172 feet, 7 inches, a personal record. In the long jump, freshman Andrew Pernisco took first place with a jump of 20 feet, 7.5 inches. On the girls team, junior Haley Stahl took first place in the 100-meter dash with a time of 13.5 seconds. Stahl also placed first in the pole vault with a height of 8 feet. 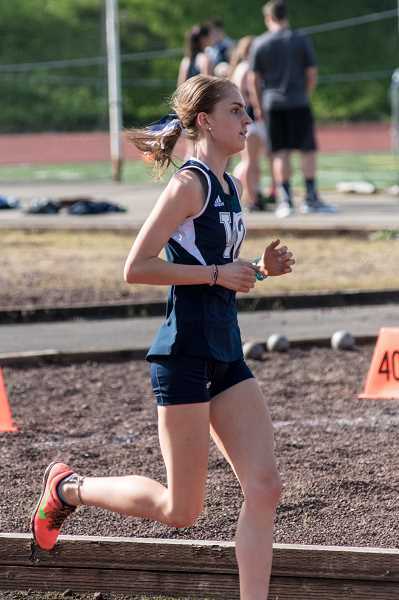 Junior Samantha Prusse was in fine form in the distance events, taking first place in the 800 meters and the 1,500 meters. In the 800 meters, Prusse took first place with a time of 2:30.60, and a time of 4:54.42 in the 1,500. Fellow distance runner and senior Kaitlyn Dougall took first place in the 3,000 meters with a time of 11:58.09. Senior Kylee Rusher took first place in the 100-meter and 300-meter hurdles, nabbing the top spots with times of 18.98 seconds and 54.76 seconds, respectively. In the shot put senior Lauren LaFreniere took first place with a mark of 34 feet, 11.5 inches. 1. Mike Church - 50'2.5"
3. Logan Thebiay - 43'11.5"
4. Jake Moore - 42'1.5"
1. Jake Moore - 120'7"
3. Ayden Lounsbury - 110'7.5"
4. Ossian Grier - 102'5"
1. Mike Church - 172'7"
2. Chase Hix - 134'4"
T3. Riley Scanlan - 5'3"
T3. Kellen Hartford - 5'3"
3. Jonah Gomez - 10'6"
4. Luke Nelson - 9'6"
1. Andrew Pernisco - 20'7.5"
2. Rocco Marshall - 19'9"
6. Kellen Hartford - 18'2"
2. Henry Tellez - 36'7"
3. Andrew Pernisco - 36'5.5"
4. Kellen Hartford - 34'10"
1. Lauren LaFreniere - 34'11.5"
2. Madison Jones - 31'9"
4. Emilia Bishop - 30'8"
2. Madison Jones - 98'10"
3. Lauren LaFreniere - 87'5"
4. Grace Mager - 85'3"
2. Delaney Dougherty - 111'1"
3. Kayla Hieb - 102'4"
4. Grace Mager - 97'9"
2. Kylee Rusher - 4'8"
3. Sydney Burns - 4'6"
3. Kellie Yoshida - 14'8.25"
4. Emilia Bishop - 13'5"
2. Kellie Yoshida - 30'8.75"
3. Sydney Burns - 30'5"
4. Emilia Bishop - 26'11"